Looking ahead to 2017, the Mitsubishi Outlander PHEV is renewed from within, with different technical improvements and safety equipment. We will not see changes facade, but the plug -in hybrid SUV will feature new products aimed at obtaining a better dynamic performance and consumption figures and emissions more advantageous. The news will be in the plug-in hybrid system itself, in managing the system driving all four wheels on the set of advanced active safety systems and infotainment elements. Change the Twin Motor System, whose electric motors now give a more immediate response. Consumption levels and emissions are reduced, which according to NEDC for hybrid low 1.8 l / 100 km to 1.7 l / 100 km, and from 42 to 41 g / km of CO2. It remains to be seen how this is reflected in everyday driving, outside of the standard approval contrived. Finally the system will have a 100% electric mode connectable with a button on the console, a lack which was very evident in the current Mitsubishi Outlander PHEV. And also it increases the range in electric mode 52-54 km. In practice, and having a plug by hand, much of the journeys can be done without spending gasoline. The electronic management system Super All Wheel Control (S-AWC) has been updated, and now a greater cornering stability is achieved by optimizing the distribution of torque between the front and rear wheels. The recalibration of the active drift control (AYC) contribute to better maneuverability. In the suspensions there are changes too, with a moron front that increases the feeling of contact with the road, while the rear has been enhanced stability, stiffness and ride comfort, as explained in Mitsubishi. The current generation did not present problems in this respect, so we have to be aware of what these developments represent more if we consider the difficulty of combining stiffness with comfort in a vehicle of 1,845 kg tare, in the current version. The news that glosses Mitsubishi deal with the detection system of blind spot (BSW), the warning system rear traffic (ATCM), the function pedestrian detection included in the mitigation system frontal collision (FCM) the electric parking brake with hill start assistant (Auto Hold) and automatic activation of headlamps. 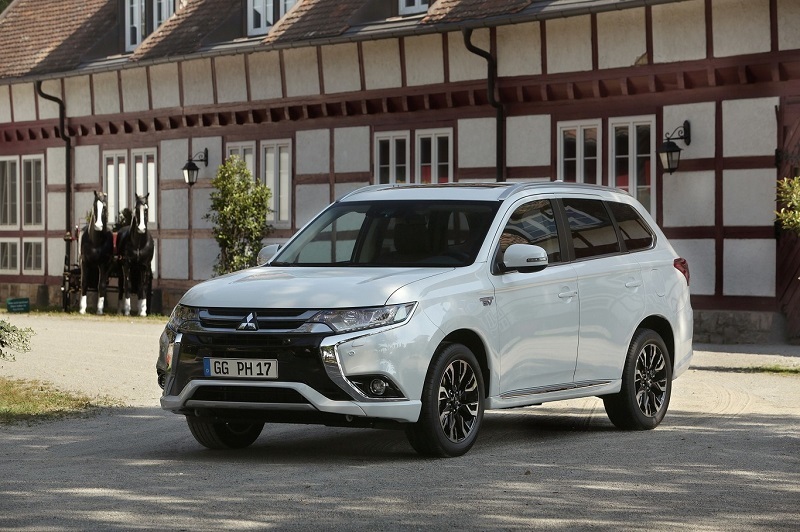 Finally, the Mitsubishi Outlander PHEV 2017 will bring a new system Infotainment SDA (Smartphone link Display Audio), with connectivity via Apple carplay and Google Android Auto, accompanying a central display multi-information that incorporates redesigned instrument panel, with a more current graphical information.